Even if you've never been to Vegas, you’ve probably heard stories of visitors going from zero to Las Rageous quicker than you can lose money at a casino. It’s a flashy destination that’s notorious for the well-earned “what happens here, stays here” mentality – but let’s face it – we’ve never been the type to follow a crowd. 1. You can find DBSI and CFM at booth #150. One quick note about our booth: you probably won’t even need to remember the actual number because you truly can’t miss it (or the digital signage it’s surrounded by). Why, you ask? It’s bright. Like, creates a shadow, “can’t look away,” bright. The kind of bright that makes you wonder if you should have brought sunglasses with you. Don’t worry! We planned for this. 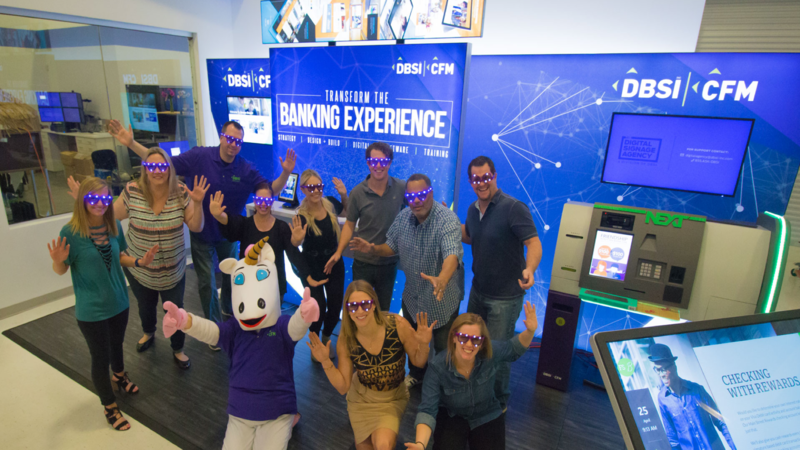 You’ll receive your own pair of purple, flashing DBSI sunglasses when you stop by (how’s that for eye-catching and protecting?). And what do you get when you combine stunner shades and a booth this lit? The perfect selfie… as long as you don’t mind Unicorns stepping in. 2. Real Talk: Yes, We’re Seriously Bringing Unicorns. Think that unicorns don’t exist? Think again. There are plenty of sights in Vegas that make you do a double take – but seriously, have you ever seen two mythical creatures roaming the Cosmopolitan hotel in bright purple polos and flashing sunglasses? Meet our unicorns, Norm and Rita. Though most unicorns can’t be captured, our one-horned friends will be rubbing shoulders with the financial industry’s best and brightest at Forum this year. They’re as fun and friendly as can be – but I wouldn’t challenge them to a dance competition. If you see them, don’t miss out on the opportunity to take a selfie – you’ll need proof for everyone back home that they’re as real as it gets. Plus, who wouldn’t want to capture a moment this magical? Step aside, David Copperfield. We’re bringing a different kind of magic to Vegas - no tricks, no illusions, just unbelievable technology creating the foundation of transformation. Sure – we like tablecloths, flyers and pens as much as the next guy – but how could any of those really communicate how we create exceptional client experiences? Seeing really is believing, and when you step into our booth, you’ll immediately be transported into an immersive, 360-degree view of a remarkable client journey. We’ve named this connection of core-integrated technology, software and innovation Branch Transformation Fusion. Designed to solve for banking’s greatest needs, the solutions within combine to elevate every touchpoint in the branch journey – and you can experience them all for yourself at Financial Brand Forum. If you’re into thrills, you can’t miss out on the chance to slide on a pair of VR goggles and get into the passenger seat of a high-speed test drive. More into tech? Check out RTA, a line busting technology essential to open branch designs and Universal Associates (and recently voted Best New Fintech Product of the year). Or NEXT, a self-service solution that brings the dream of a high-tech, high-touch branch where clients can choose the way they bank to reality. You’ll also find digital signage that’s so eye-catching, you can’t help but stare – and because this isn’t a museum, you can look and touch our interactive kiosks for an enhanced view into client discovery. Whether you want to create a killer branch experience, foster relationships, boost sales, onboard to digital channels, or make your brand come alive, what you say and how you say it matters. Join to learn the secret language proven by research to turn your digital signage and any branch communication into irresistible engagement tools. It’s not for the faint of heart, so come prepared – you’ll leave the session armed with tangible strategies to be a master of persuasive communication. That’s it! You’re all set for Financial Brand Forum. It’s going to be an epic couple of days – and we can’t wait to see you at booth #150.